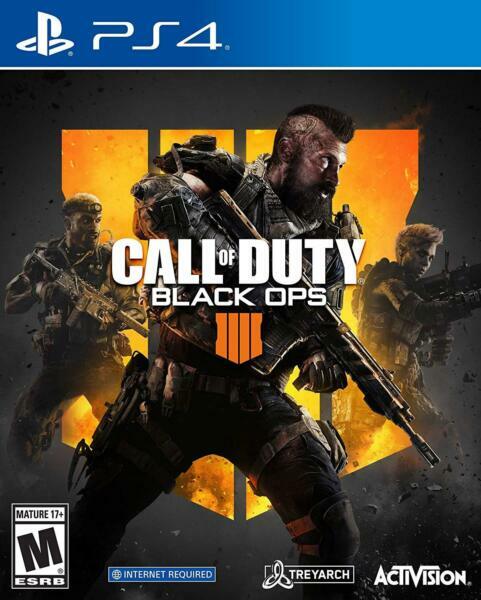 eBay Call of Duty: Black Ops 4 - PlayStation 4 - First Person Shooter - TACTICAL, GROUNDED MULTIPLAYER - THE BIGGEST CALL OF DUTY ZOMBIES EVER Release Date: 10/12/2018The most thrilling multiplayer experience offers tactical, grounded gameplay and player choice.The biggest Day 1 Zombies offering ever with three full experiences at launch.In Blackout, Black Ops comes to life in a massive battle royale experience. Manufacturer Activision Blizzard, Inc Manufacturer Part Number 88225 Brand Name Activision Product Name Call of Duty: Black Ops 4 Product Type Software Product InformationSoftware Main TypeGameSoftware NameCall of Duty: Black Ops 4Platform SupportedPlayStation 4 Please understand , this is only one of over 100,000 products offered for sale by antonline and shipped from our many different automated warehouses. There are no local stores or pick up. All the product information we have is provided by the manufacturer and in the item listing. Manufacturers change colors and item details frequently and often do not update pictures. We have no personal knowledge or experience with this product or ability to customize it. All items ship as addressed in an automated warehouse. The time to process and ship is listed prominently in each listing. It usually takes about a week to get your item. It may be faster or longer as shown in the listing or if credit check or special handling is required. There is no human intervention in the process. That is how we control costs and keep prices are so low. Paypal requires that we only ship to the verified Paypal address provided with the order. NO ADDRESS CHANGE IS POSSIBLE. Atlanta Network Technologies, Inc. We accept payment by: Paypal. Shipping to: United States Excludes: Alaska/Hawaii, APO/FPO, US Protectorates, PO Box. Antonline eBay Return Policy Returning an item purchased from antonline is easy and fully automated with our "Hassle Free Return Program". Please email to request an RMA link.